In a case before Supreme Court Justice Pam Jackman Brown, sitting in Queens County, Supreme Court, a husband brought a lawsuit for divorce against his wife, claiming irreconcilable differences. The wife sought to have equitable distribution of assets in the divorce case. The husband claimed all the assets the wife sought were accumulated by him prior to the marriage. Justice Brown found there were no joint assets accumulated by the parties during the course of the marriage and therefore the wife was not entitled to equitable distribution for the property she claimed were marital assets. The wife presented an argument that she had a long term relationship with her husband which took place prior to the marriage. She therefore claimed the assets that were accumulated by her husband during their relationship prior to the marriage should be considered marital assets subject to equitable distribution. Justice Brown ruled against the wife. She found there was no documentary evidence showing wife contributed financially to the assets which she alleged were subject to equitable distribution and acquired by the husband prior to the marriage. Justice Brown found the wife did not sustain her burden of proof to show a constructive trust was created between the parties before the marriage. Justice Brown gave the wife a $10,000.00 lump sum equitable distribution award related to the marital residence. 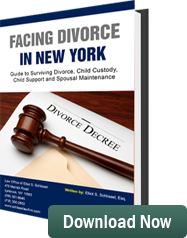 Only assets accumulated during the marriage are subject to equitable distribution in the State of New York. All other assets are considered separate property of each of the parties and are not considered assets of the marriage.